The EquiDry 200 is available in both a fluorescent and LED option. It is a premium high bay that is durable enough for all types of riding arenas and coliseums. The vented center ballast channel add rigidity while providing excellent heat dissipation. The side mount access plate allows the fixture to be wired and installed without removing the lamps and provides access to the center knock out. The EquiDry 200 is the most configurable and complete high bay line available. All purpose, premium high ceiling. 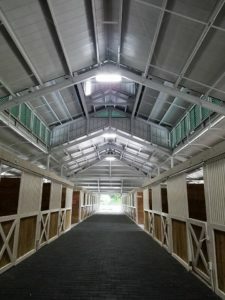 Suitable for most high ceiling applications including but not limited to: indoor and/or covered riding arenas, barn aisles, and maintenance & hay barns. All options and accessories are available.